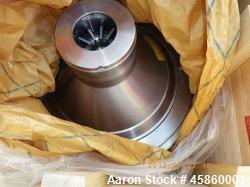 Below is Aaron's inventory of unused and used disc automatic centrifuges. 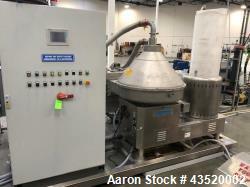 If you are looking to sell your used disc automatic centrifuge submit a request online or contact Erik Eichert at 630-238-7480. 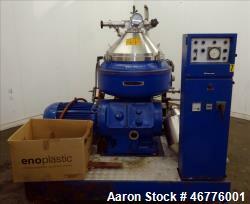 Used- Alfa Laval CH-700C Desludger Disc Centrifuge. 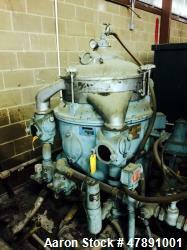 Used- Alfa Laval MAPX-207 Desludger Disc Centrifuge. 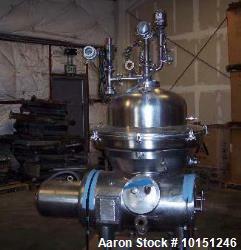 Stainless steel bowl assembly, separator design (liquid/liquid/solids), 7.5 hp drive motor, control mounted on skid. 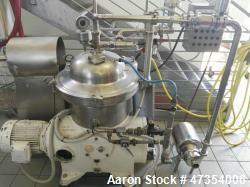 Used- Alfa Laval LAPX-404-SGP-31G Desludger Disc Centrifuge. Stainless steel construction (product contact areas), max bowl speed 9300 rpm, clarifier deign (liquid/solids separation), centripetal pump liquid discharge. 3kw drive motor, belt drive configuration, mounted on cart. 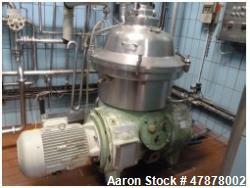 Used- Alfa Laval WHPX-405TGD-24-60 Desludger Disc Centrifuge. Stainless steel bowl assembly, carbon steel top cover. Three phase design, direct driven by a 5 hp motor on stand. With Blackmer pump, tank and panel. 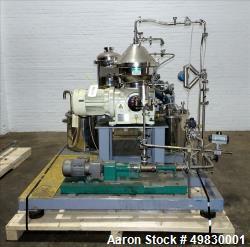 Used-Alfa Laval WSPX-303-TGP-71 Desludger Disc Centrifuge. Stainless steel 316 bowl, 3 hp/2.2 kW motor, estimated capacity 53 cubic feet/hour (1,500 liter/h), mild steel frame and cover in silumin. 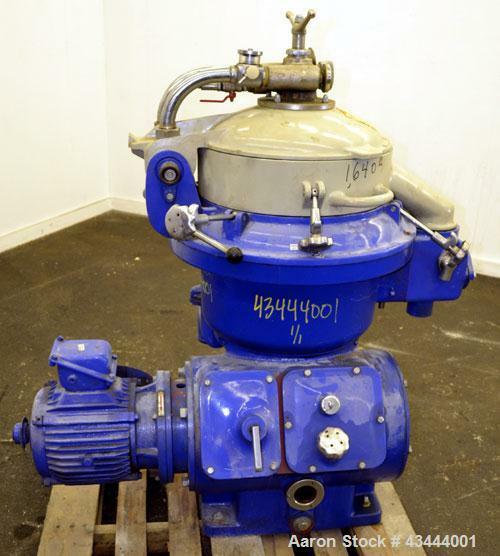 Used- Delaval-Alfa Laval MAPX-207 Desludger Disc Centrifuge, 316 stainless bowl assembly (product contact areas), separator design (liquid/liquid/solids separation), flanged drive motor. Direct driven by a 5.5 kw (7.3 hp), 440/60/3 motor. Fan motor broken, missing lock ring, packing, gravity disc, and seal ring. 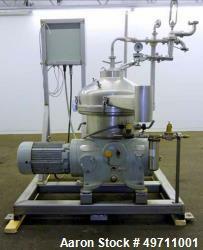 Used- Alfa-Laval MAPX-313-TGT-24-60 Desludger Disc Centrifuge. Stainless steel bowl, Concentrator design (liquid/liquid/solids separation), 25 hp flanged mounted drive motor 208/230/460/3/60. 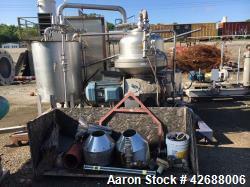 (Reported to be set up for biodiesel). 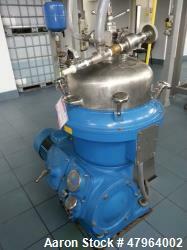 Used- Alfa-Laval MAPX-313-TGT-29-60 "Oil Purifier" Desludger Disc Centrifuge. 329 Stainless steel bowl. Aluminum top cover. Concentrator design (liquid/liquid/solids separation), direct driven by a 20 hp, 3/60/230/460 volt, 1770 rpm motor. Includes control panels. Mounted on a skid. 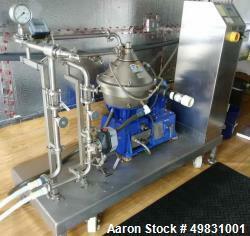 Used- Alfa Laval WSPX-307-71G Desludger Disc Centrifuge. 316 Stainless steel (bowl assembly with aluminum bowl covers). Maximum bowl speed 8375 rpm, concentrator design (liquid/liquid/solids separation), light phase centripetal pump liquid discharge, belt drive configuration, 7.5kw drive motor 380/3/50. Mounted on frame. Used- Alfa Laval BRPX-214-HGV-34-1250 Desludger Disc Centrifuge. 316/329 Stainless steel product contact areas, bottom feed configuration, clarifier design (liquid/solid separation), centripetal pump liquid discharge, 18.5kw/25hp, 380/3/50 direct motor, control panel and sludge tank. 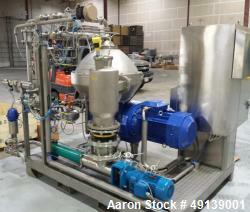 Used- Alfa Laval VNPX-310-SDG-34 Desludger Disc Centrifuge. 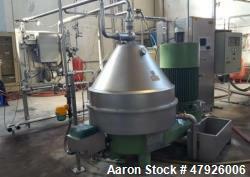 Used- Alfa Laval VNPX-310-SDG-34 Desludger Disc Centrifuge. Stainless steel construction (product contact areas), clarifier design (liquid/solid separation),centripetal pump liquid discharge, 22 KW 380/3/50 drive motor, control panels, sludge tank and platform. 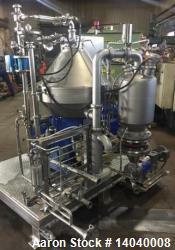 Used- Alfa Laval SRPX-213 HGV-14H Desludger Disc Centrifuge. 316 Stainless steel construction (product contact areas), separator design liquid/liquid/solids, bottom feed design, flange drive motor, 15 kW drive motor 400/3/50/1420-1500 rpm. Used- Alfa-Laval MAPX-309-BGT-14-60 Desludger Disc Centrifuge. Stainless steel/bronze bowl construction, separator design (liquid/liquid/solids separation), hinged aluminum bowl top cover, 15hp flange mounted drive motor 208/230/460/3/60. 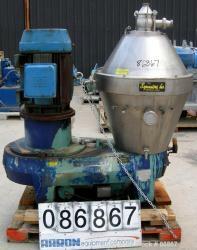 Used- Alfa Laval BRPX-207SGV Desludger Disc Centrifuge. Stainless steel construction (product contact areas), clarifier design, centripetal pump liquid discharge. 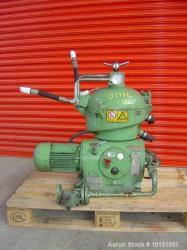 Approximately 15 hp explosion proof drive motor 380/3/50, sub-base. Last used in a berry application. Used- Alfa Laval SRPX-213HGV-14H Desludger Disc Centrifuge. 316/329 Stainless steel construction (on product contact areas). Separator design liquids/liquids/solids bottom feed design, driven by a 15kw, 380/3/50 motor. Unused- Alfa Laval Separator, Model Double Module SU846. In-Line configuration. Approximate 5,000 max. capacity. Includes electric heaters, pumps, interconnecting pipework, control panel "plug and play". 380 Volt, 60 Hz, 13080 long x 1050 wide x 1245 high. Approximately 700 kg. Used- Alfa Laval Centrifuge, Model SMG509H-75C. Used- Alfa Laval Centrifuge, Model SMG509H-75C. 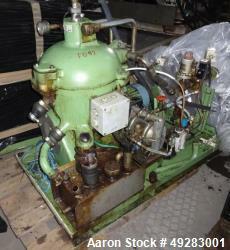 Includes: 10 hp motor. Frame has been newly powder coated. Manual. Tools. Water Harness. Reported to be reconditioned. Does not include controls. 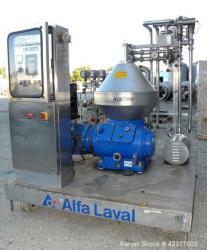 Used- Alfa Laval Brew 301 Centrifuge. Stainless steel. 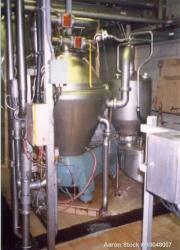 Used- Alfa Laval Brew 301 Centrifuge for Beer Beverage Stainless steel. 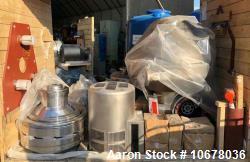 Includes: Spare parts, special service tools, all service manuals and parts catalogs. Centrifuge, Disc Automatic. Last used in an Apple cider application. 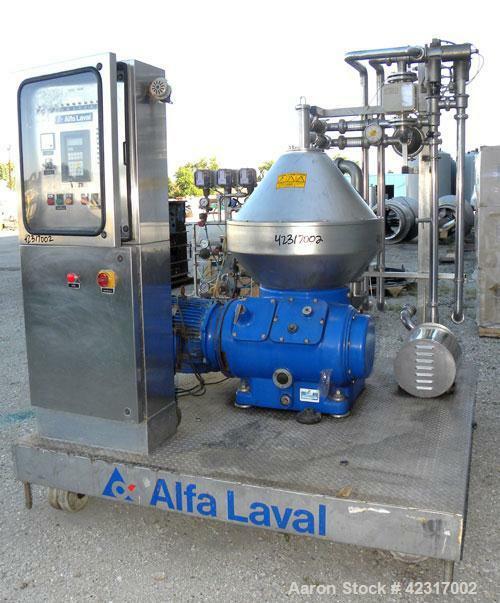 Used- Alfa Laval MOPX-210 TGT-24-60 Oil Purifier Centrifuge. 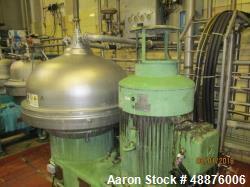 Used- Alfa Laval MOPX-209-210-TGT-20 Desludger Disc Centrifuge. 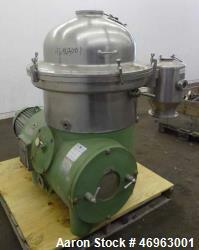 Used- Alfa Laval MOPX-209-210-TGT-20 Desludger Disc Centrifuge. 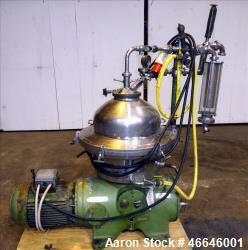 Includes: 20hp clutch drive motor, manual, tools, bowl: parts have been nickel coated. Does NOT include controls. Reported to be reconditioned. 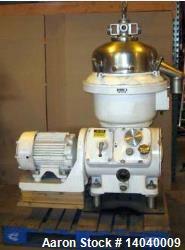 Used- Alfa Laval MRPX-313-HGV-14 H- 21 Desludger Disc "cream separator" Centriuge. 316 Stainless steel construction (product contact areas), hermetic separator design liquid/liquid/solids, top feed design, flange drive motor, 15KW drive motor 380/3/50/1420-1500 RPM. Approx. 1.7 tonnes. 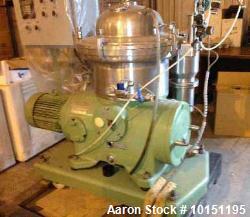 Used- Alfa Laval WSPX-403 SGP-31G Desludger Disc Centrifuge. Unused- Alfa Laval WSPX-403 SGP-31G Desludger Disc Centrifuge. 316 stainless steel product contact areas. Maximum bowl speed 9510 rpm, clarifier design. Belt driven by a 2.2 kw (3.3 hp). New 2007. 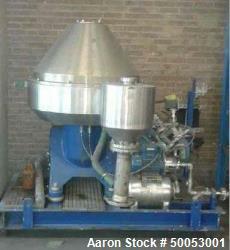 USED: Alfa Laval WHPX-505-TGD-24-60/881002 Desludger Disc Centrifuge, 316 stainless steel/aluminum construction. 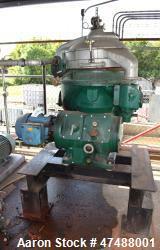 Separator design, direct drive, 45 kw (5.3 hp) drive motor 550/3/60. 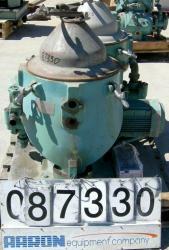 Used- Alfa Laval WHPX-505-TGD-24-60/881002 Desludger Disc Centrifuge. 316 stainless steel/aluminum construction. 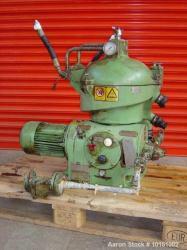 Separator design, direct drive, 45 kw (5.3 hp) drive motor 550/3/60. 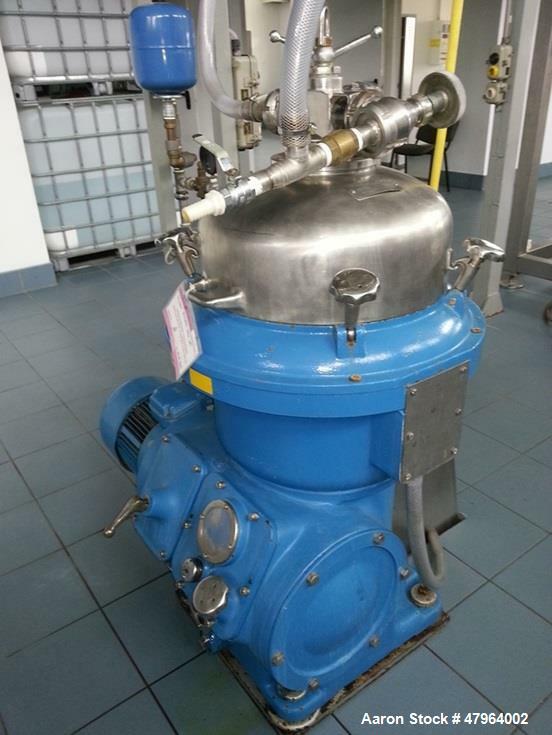 USED- Alfa Laval MAPX-204-TGT-24-60 Desludger Disc Centrifuge. 316 Stainless Steel/Aluminum Construction. 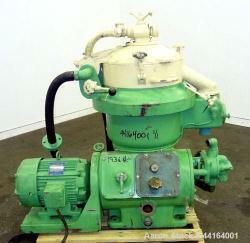 Separator design, direct drive, 3 HP, 3/60/550 Volt, motor. 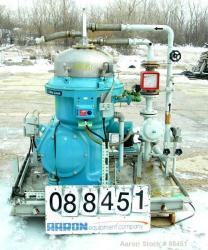 Duplex pump driven by drive motor. 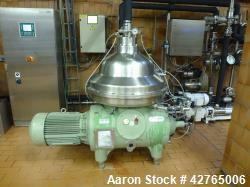 Used- Alfa Laval WSPX-207-TGP-74 Desludger Disc Centrifuge, 316 Stainless Steel Product Contact Areas. Maximum bowl speed 6321 rpm, concentrator design. Direct driven by a 7.5 kw (10 hp), 3/50/380/420 volt, 1450 rpm motor. 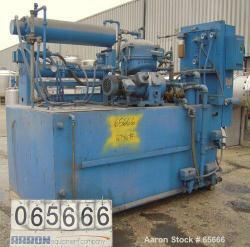 Used- Alfa Laval WSPX-207-TGP-74 Desludger Disc Centrifuge. 316 Stainless Steel Product Contact Areas. Maximum bowl speed 6321 rpm, concentrator design. Direct driven by a 7.5 kw (10 hp), 3/50/380/420 volt, 1450 rpm motor. 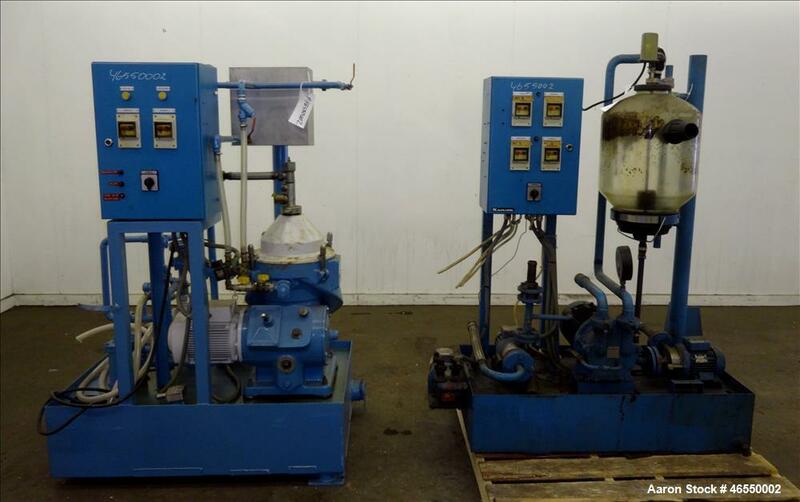 Used- Andritz-Frautech Disc Stack Separator, Model #: CAO 201 PMO. Stainless steel, 46 Liter bowl with 19.7 liter sludge capacity. 5,000 rpm, 3" inlet/outlet, variable discharge volume, 37 kw Motor. Year. 2011. 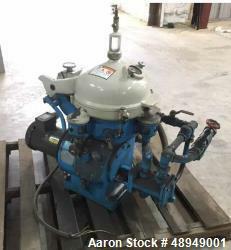 Used- Delaval AFPX-207 Desludger Disc Centrifuge. 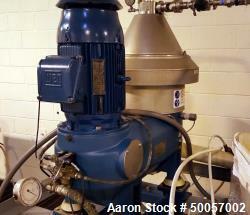 Used- Delaval AFPX-207 Desludger Disc Centrifuge. Stainless steel construction (product contact areas). Separator design (liquid/liquid/solids separation). Light phase centripetal pump liquid discharge, heavy phase gravity over-flow, flanges drive motor, approximately 15 hp drive motor 460/3/60, clutch drive. 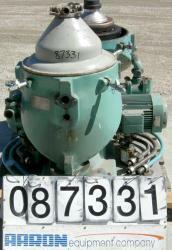 Used- Delaval MAPX-309-BGT-29-60/4094-16 Guardian Purifier Disc Centrifuge, 316 Stainless Steel. Maximum bowl speed 1700-1800 rpm. Direct driven by a 15 hp motor. Skid mounted with control panel. 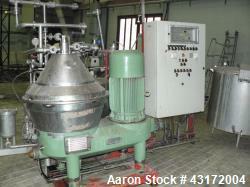 Used- Hutchison Hayes HH-219 (Alfa-Laval MAB) Solid Bowl Disc Centrifuge. 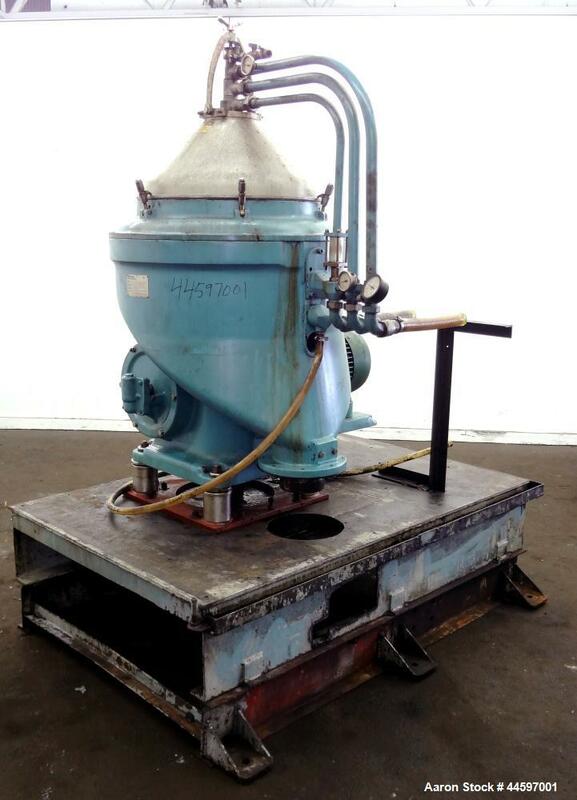 Used- Hutchison Hayes HH-219 (Alfa-Laval MAB) Solid Bowl Disc Centrifuge. 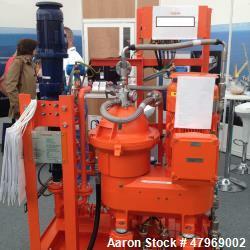 Biodiesel cleaning system. 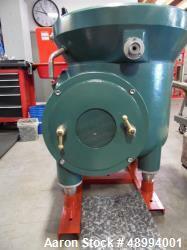 Includes water seal alarm, starter, valves, and piping. Designed for: purification, degumming, wash water removal, glycerin separation and clarification. Used Pieralisi SD 300BD Desludger Disc Centrifuge. Stainless steel on product contact areas. Maximum bowl speed 6400 rpm. Separator design (liquid and heavy phase separation). Approx. 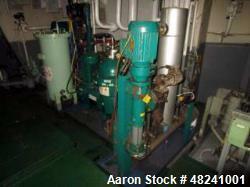 16.6 hp/11 Kw-380 volt/50cycle/3Ph ATEX II 26CP T4 motor. Mounted on a platform. Control panel. New 2006. 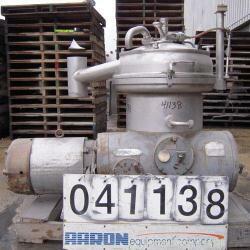 Last used in a waste oil application. 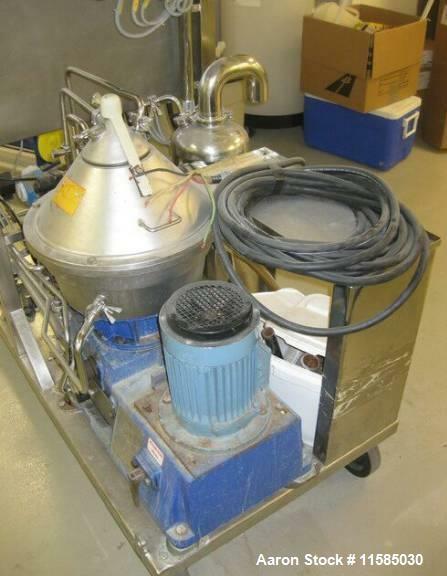 Used-Sudmo KMA MKRS-330U Desludger Disc Centrifuge, stainless steel construction (product contact areas), max bowl speed 4600 rpm, whey clarifier design, centripetal pump liquid discharge, belt drive configuration, approximately 50 hp drive motor. 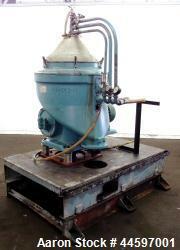 Used- Westfalia SB-60-36-177 Desludger Disc Centrifuge. 316 stainless steel on product contact areas. Maximum bowl speed 4950 rpm, self-thinking solids discharge design, centripetal pump liquid discharge, belt drive configuration, 33 kW drive motor, 380/50/3, TVE 2-E/SB60 control panel. Used- Westfalia CSA 160-47-406 Desludger Disc Centrifuge. Used- Westfalia SA-45-03-076 Desludger Disc Centrifuge. Used- Westfalia SA-45-03-076 Desludger Disc Centrifuge. Includes: New 30 hp motor with direct drive, manual, tools, frame was powder coated. Carrier protection and lock ring had wear protection added. Sliding bowl bottom and bowl bottom had wear protection added. Does NOT include controls. Reported to be reconditioned. 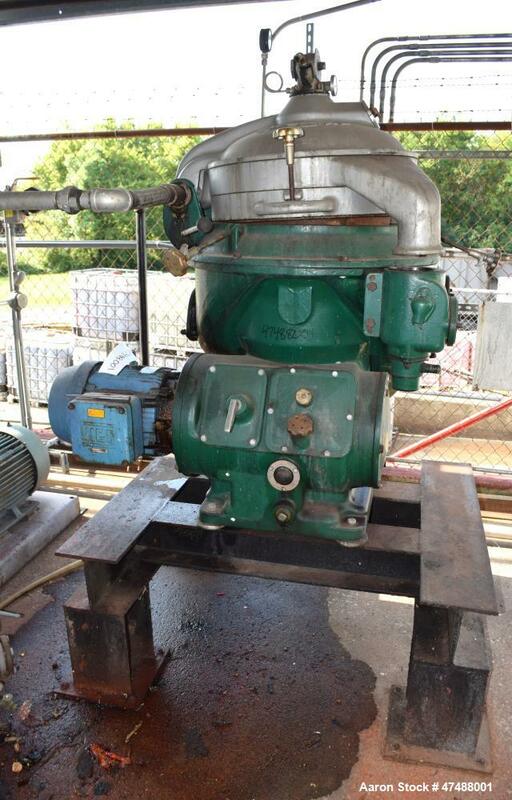 Used Westfalia SA-20-03-076 Desludger Disc Centrifuge stainless steel construction product contact areas, separator design (liquid/liquid/solids separation, light phase gravity over-flow, heavy phase centripetal pump liquid discharge, cutch drive motor manual tools. Does not include controls. Reported to be reconditioned. 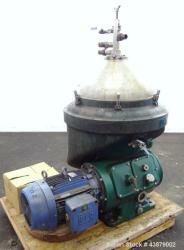 Used- Westfalia SA-20-03-076 Desludger Disc Centrifuge. Unused-Westfalia CRA-500-06-777 Desludger Disc Centrifuge, stainless steel construction (product contact areas), clarifier design, hydro-hermetic design, centripetal pump liquid discharge, timing unit, 75 kw drive motor, frequency converter 400/3/50. Used- Westfalia SB-14-06-076 Desludger Disc Centrifuge. 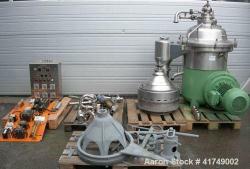 Used- Westfalia RSA-60-01-076 "refining" Desludger Disc Centrifuge. Stainless steel construction (product contact areas). 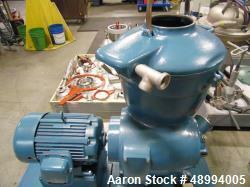 Max bowl speed 6450 rpm, separator design (liquid/liquid/solids separation), light and heavy phase centripetal pump liquid discharge, direct drive, approximately 20 hp drive motor. Used- Westfalia SA-35-36-076 Desludger Disc Centrifuge. Used- Westfalia SA-35-36-076 Desludger Disc Centrifuge. 316 stainless steel (product contact areas). 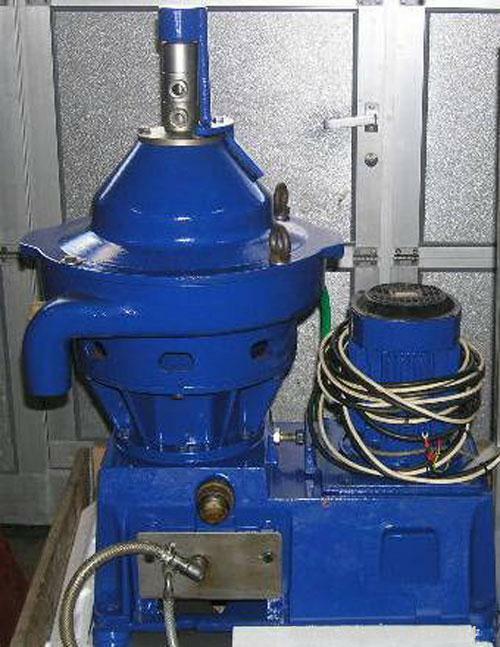 6550 rpm maximum bowl speed, clarifier design (liquid/solids separation), centripetal pump liquid discharge. 18.5 kW drive motor 380/3/50. Control panel, mounted on skid base. Last used in a wine application. Used- Westfalia SAMR-3036 Desludger Disc Centrifuge. 316 Stainless steel (product contact areas); maximum bowl speed 6500 rpm. Clarifier design (liquid/solids separation). Centripetal pump liquid discharge, water harness. 15kw drive motor 380/3/50. Previously used in a wine application. Used- Westfalia CSA 160-47-076 Desludger Disc Centrifuge. 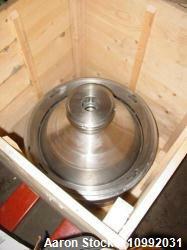 Stainless steel construction (product contact areas).Max bowl speed 6750 RPM. Clarifier design (liquid, solid separation). 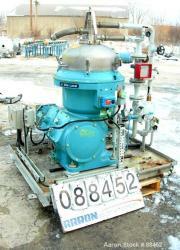 Centripetal pump, liquid design, 380/3/50 drive motor. Siemens S7 control panel. Previously used in a Brewery Application. Used- Westfalia SC 35-06-177 Desludger Disc Centrifuge. Used- Westfalia SC 35-06-177 Desludger Disc Centrifuge. Stainless steel construction on product contact areas, maximum bowl speed 7230 rpm, clarifier design (liquid/solids separation) centripetal pump liquid discharge, belt drive configuration, 18.5kw 380/3/50drive motor, does not include control panel. 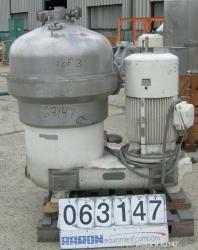 Used- Westfalia SC-35-06-177 Desludger Disc Centrifuge. 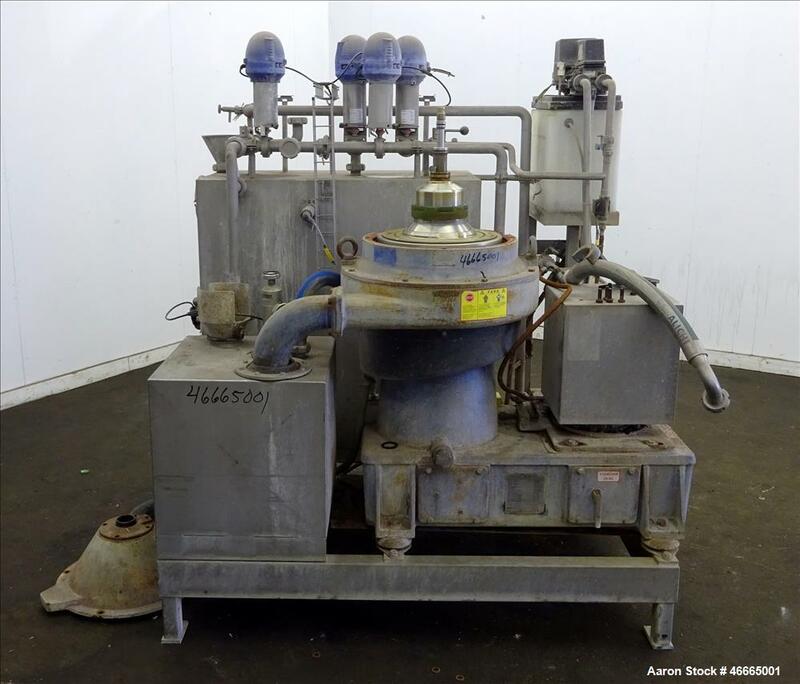 Used-Westfalia SA-60-47-076 Desludger Disc Centrifuge, 20,000 liters/hour; stainless steel construction (product contact areas), max bowl speed 4800 rpm, hydro-hermetic clarifier design, control panel; self-cleaning. 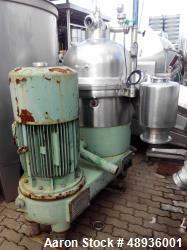 Used- Westfalia SAOWH-3036 Desludger Disc Centrifuge, 316 stainless steel construction (product contact areas). Max bowl speed 7700 rpm, separator design, light phase centripetal pump liquid discharge, heavy phase gravity discharge, water harness. Direct driven by a 10 hp, 3/60/550 volt, 1760 rpm XP motor. Used- Westfalia SA-80-06-177 Desludger Disc Centrifuge Bowl Assembly. Stainless Steel construction, clarifier deign (liquid/solid separation). 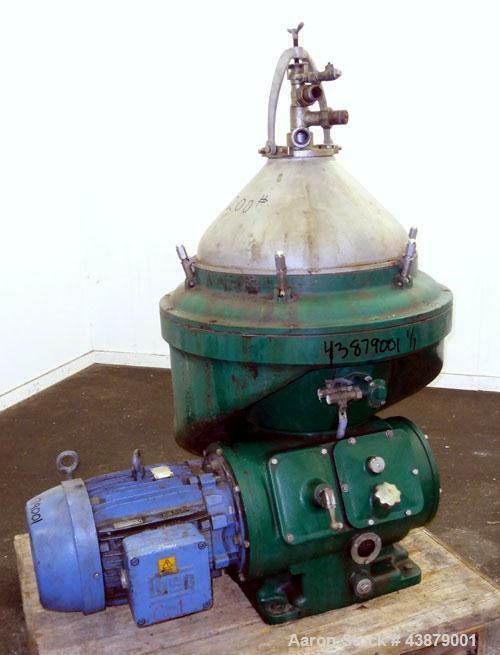 Used- Westfalia CSC-20-47-476 Desludger Disc Centrifuge, stainless steel construction (product contact areas), maximum bowl speed 8340 rpm, clarifier design (liquid/solids separation, hermetic design, controls with vfd, pumps, piping, mounted on skid. 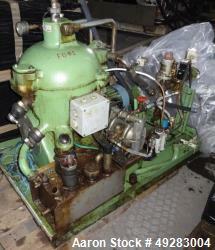 Used- Westfalia CSA-8-06-476 Desludger Disc Centrifuge. Stainless steel construction (product contact areas), maximum bowl speed 9160 rpm, clarifier design (liquid/solids separation) centripetal pump liquid discharge, 7.5 hp drive motor, controls with Allen Bradly PLC, pumps, skid mounted. 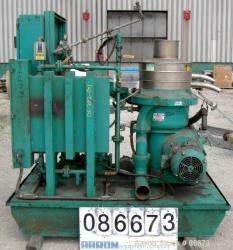 Used-GEA Westfalia OSC-4-91-006 Self-Cleaning Disc Separator. Stainless steel construction. 9980 rpm. 400/690V/50 hz. With tools and miscellaneous spare parts. 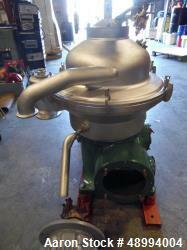 Used- Westfalia SA-14-06-076 Desludger Disc Centrifuge. Stainless steel construction (product contact areas), max bowl speed 7500 rpm, clarifier design (liquid/solids separation), centripetal pump liquid discharge, 7.5 kw drive motor 380/3/50, sub-base. 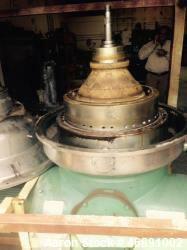 Used- Westfalia SA-20-06-076 Desludger Disc Centrifuge. Stainless steel construction (product contact areas), max bowl speed 6400 rpm, clarifier design (liquid/solids separation), centripetal pump liquid discharge, 20 drive motor . 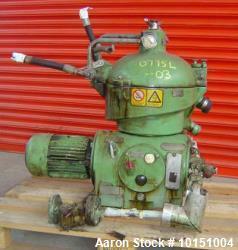 Used- Westfalia MSA-100-01-076 Desludger Disc Centrifuge. Stainless steel construction (product contact areas), max bowl sped 4500 rpm, separator design (liquid/liquid/solids separation), centripetal pump liquid discharge, 22 kw drive motor. Used- Westfalia SA-80-47-076 Desludger Disc Centrifuge. Used- Westfalia SA-80-47-076 Desludger Disc Centrifuge. Stainless steel construction (product contact areas). Max bowl speed 4500 rpm, hermetic clarifier design, centripetal pump liquid discharge, direct drive, sludge tank, control panel. Previously used in a wine application. 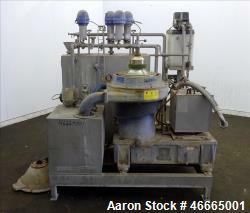 Used- Westfalia CSA-500-06-777 Desludger Disc Centrifuge. 316 stainless steel construction (product contact areas). Maximum bowl speed 5400 rpm. Clarifier design (liquid/solid separation). Centripetal pump liquid discharge. Belt drive configuration, drive motor. 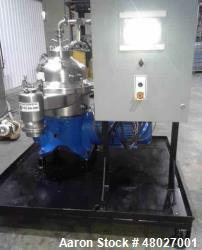 Sludge pump unit, control panel.110 KW-380/440volt/50 cycles. Used- Westfalia SA-60-47-076 Desludger Disc Centrifuge. 20,000 liters/hour. Stainless steel construction (product contact areas), max bowl speed 4800 rpm, hydro-hermetic clarifier design, control panel. Self-cleaning. Last used in a Beer application. Used- Westfalia SAMR-5036 Desludger Disc Centrifuge. 316 Stainless steel (product contact areas), maximum bowl speed 6200 rpm, clarifier design (liquid/solids separation), centripetal pump liquid discharge 22kW drive motor 380/3/50. Used- Westfalia SB 80-36-777 Desludger Disc Centrifuge. Used- Westfalia SB 80-36-777 Desludger Disc Centrifuge. 316 stainless steel (product contact areas), maximum bowl speed 4950 rpm, clarifier design (liquid/solids separation), centripetal pump liquid discharge. Approximate 45kw drive motor (380/3/50). 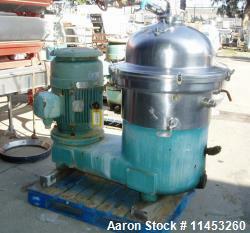 Includes sludge pump and tank. New 1981. Previous used on wine. 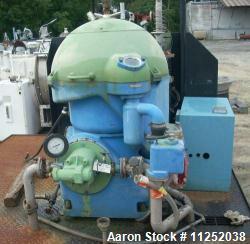 Used- Unused Westfalia Disc Stack Centrifuge, Model OTC 20-01-937. Vertically mounted Seepex pump and piping, non-self-cleaning, a solid wall bowl. Driven by a flanged 3-phase motor, IP56 and ATEX EEx de IIC T4. Dual voltage 400V 50Hz and 460V 60Hz. Mounted on custom skid. Mfg. 2014. 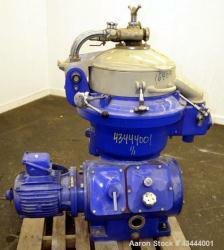 Used- Westfalia Separator, Model SAMR 5036. Self cleaning classifier, self cleaning bowl. Gas tight design of neck bearing bridge. New PLC control panel, CUI manufactured skid frame. Works well with hot oil applications. Used- GEA/Westfalia WSD-18-01-037 Desludger Disc Centrifuge. Max speed 10,000 rpm. 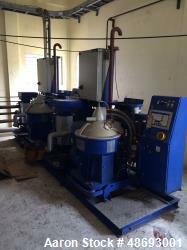 Separator design (liquid/liquid solids separation), Motor 50 Hz, 7.5 Kw (10 Hp). All stainless steel wetted parts. Mfg. in 2007. Last used in a waste oil application. 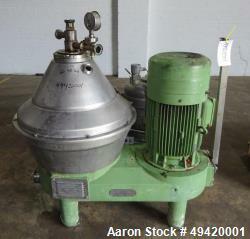 Used- Westfalia BKA35-86-076 Solid Bowl Disc Centrifuge. 316 Stainless steel construction (product contact areas). 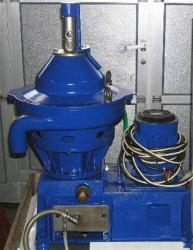 Maximum bowl speed 5000 rpm, two chamber bowl design, centripetal pump liquid discharge. Driven by a 25 hp, 3/60/230/460 volt, 1780 rpm direct drive motor. 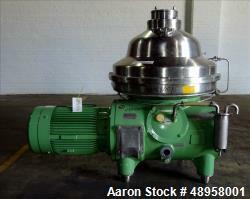 Used- Westfalia BKA35-86-076 Solid Bowl Disc Centrifuge. 316 Stainless steel construction (product contact areas). Max bowl speed 5000 rpm, two chamber bowl design, centripetal pump liquid discharge. Driven by a 25 HP, 3/60/230/460 volt, 1780 rpm direct drive motor. Requires feed inlet assembly(missing). 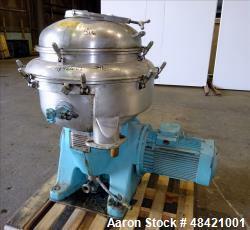 Used- Westfalia BKA35-86-076 Solid Bowl Disc Centrifuge. 316 Stainless steel construction (product contact areas). 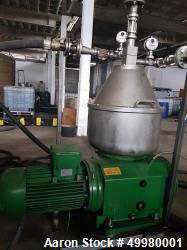 Max bowl speed 5000 rpm, two chamber bowl design, centripetal pump liquid discharge. Driven by a 25 HP, 3/60/230/460 volt, 1780 rpm direct drive motor. 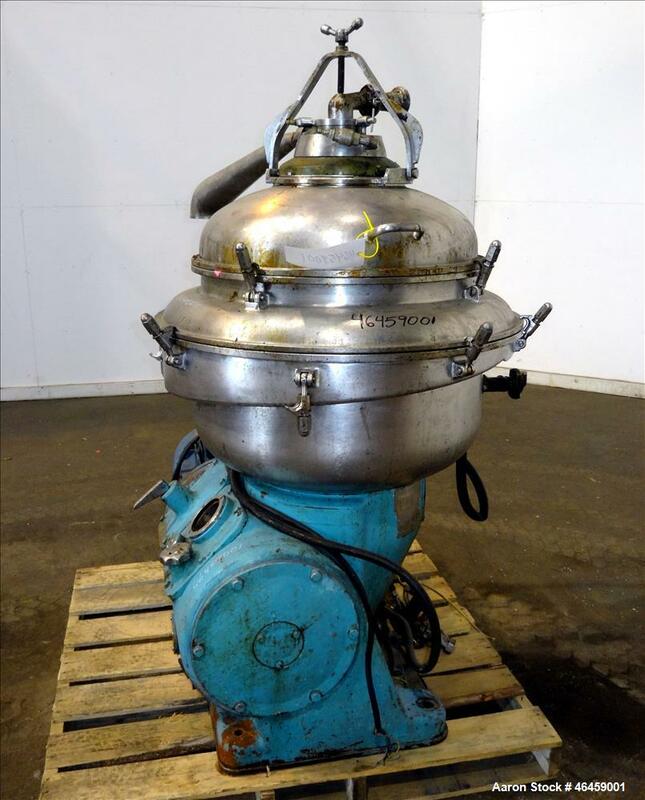 Used- Westfalia BKA-35-86-076 Solid Bowl Disc Centrifuge. 316 Stainless steel construction (product contact areas). 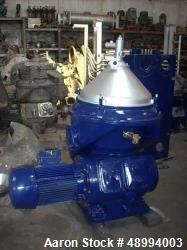 Max bowl speed 5000 rpm, two chamber bowl design, centripetal pump liquid discharge. Driven by a 25 HP, 3/60/230/460 volt, 1780 rpm direct drive motor. Requires feed inlet assembly(missing). 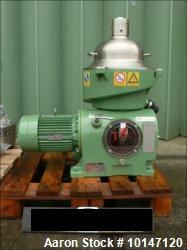 Used- Westfalia Separator, Model SD18-0196-067/15. Max. admissible rated bowl speed in min: 11500. Max. admissible density of the feed product: heavy liquid 1.0 kg/dm3, solids 1.4 kg/dm3; Mfg. 2009. 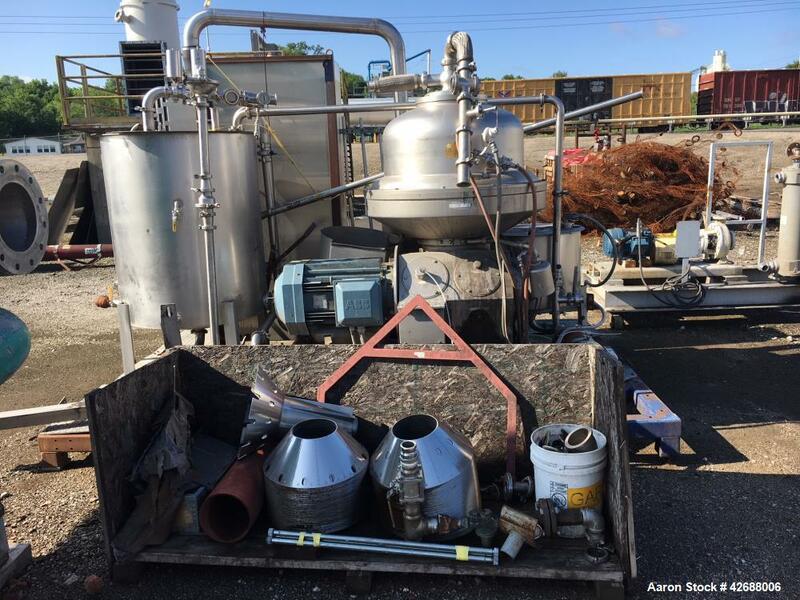 Used- Alfa Laval Brew 300 (BRPX-710-SFD-34CCL) Desludger Disc Centrifuge, stainless steel construction (product contact areas), maximum bowl speed 7488 rpm, clarifier design (liquid/solids separation), centripetal pump liquid discharge, cyclone slurry tank with pump, flange mounted drive motor, base mounted piping, valves. Mounted on approximate 6' x 6' base, control. 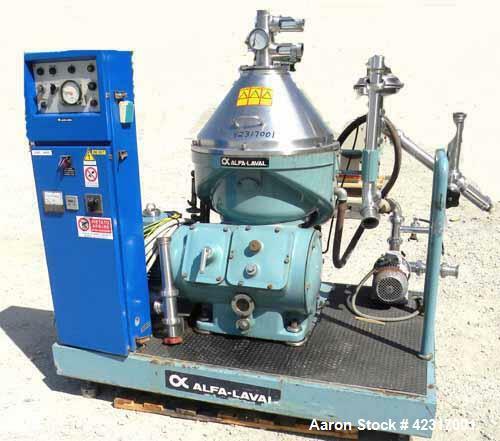 Used- Alfa-Laval VNPX-407-SGT-34-50 Desludger Disc Centrifuge, 329/304 Stainless Steel Construction (product contact areas), clarifier design (liquid/solids separation), maximum bowl speed 7310 rpm, centripetal pump liquid discharge. Direct driven by a 11 kw/16.50 hp, 380/3/50 motor. 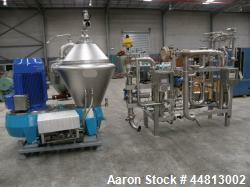 Includes (1) pump, (1) electric control cabinet and pipe infrastructure. Mounted on a foundation platform. Mobile on 4 wheels. 4 screw feeds for stationary position. 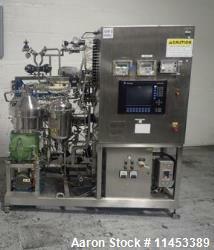 Used- Alfa-Laval CHPX 510-SGD-34CGT-50 Desludger Disc Centrifuge, 2205 Stainless Steel Construction (Product Contact Areas). Clarifier design (liquid/solids separation), centripetal pump liquid discharge, 18.5 KW/27.75 hp Brook Hansen x Alfa Laval motor, 380/3/50. Includes (1) stainless steel sludge tank, (1) Lafert sludge pump, 5.55 HP/3.7 kW motor 400/50/3. (1) Stainless steel electric control cabinet, (1) ASA flow control 4232 gallon (0-16000 liter/hour), (1) SAT Control pressure control 0-150 PSI (0-10 bar) and pipe infrastructure. Mounted on a foundation platform with 4 wheels. 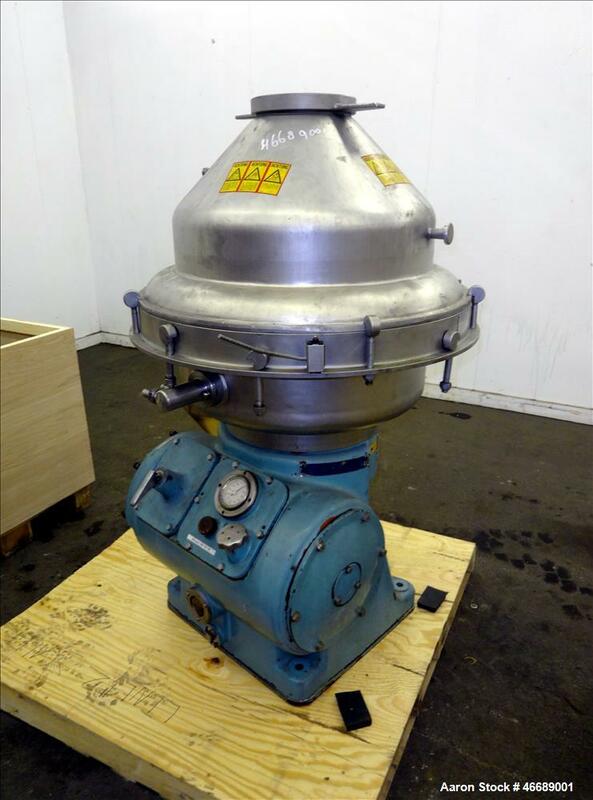 Used- Alfa Laval Model AFPX-617- XGV-14CG Desludger Disc Centrifuge, stainless steel construction (product contact areas), maximum bowl speed 4480 rpm. Separator design (liquid, liquid/solids separation), heavy phase centripetal pump liquid discharge, timed variable solids discharge, water harness, flanged drive motor with rigid coupling, controls, mounted on skid with miscellaneous tank and pump. Mfg. 2003. 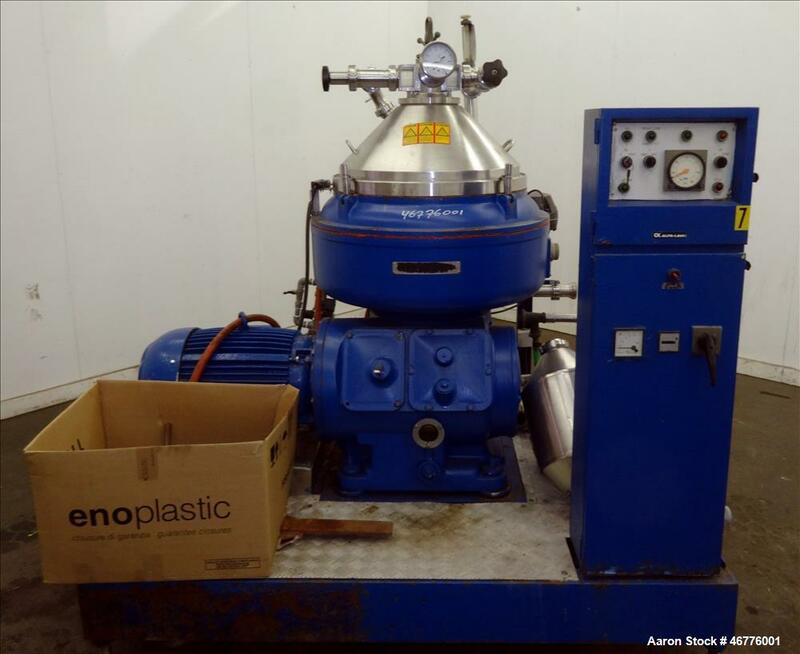 Used- Alfa Laval BRPX-717SFV-310SL Desludger Disc Centrifuge, stainless steel product infeed system; 75 kw, 415V, 50 hz motor; max bowl speed 4800 rpm; max density of feed 1100 kg per cubic meter; max density of sediment 1516 kg per cubic meter; max density of operating liquid 1000 kg per cubic meter; process temp min/max -5/100 deg C. Manufactured 1996. Used- Alfa Laval MOPX-210 TGT-24-60 Oil Purifier Centrifuge. 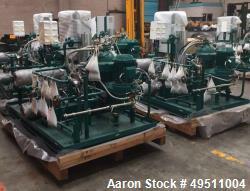 Includes: 3/60/440v, 1755 rpm, 15 hp motor, solenoid valve blocks for operation water. Mounting parts kit, special set of select tools, select (3) gravity discs. Separate feed pump/motor, pairing disc pumps for both heavy and light phase. Automatic Touch-Screen PLC controller including motor starter, water harness for self-cleaning function. 22/24 kW Heatpac electric heater, sludge tank with level alarm and diaphragm pump and a 50 gallon buffer tank for clean processed oil with level switch. Reported to be refurbished. 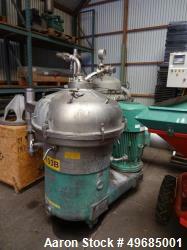 Used- Alfa Laval BRAX-213S-31B "Ultra Polishing" Desludger Disc Centrifuge. Stainless steel product contact areas, 6770 rpm blow speed. 14,200 x "G" force, hydro-hermetic, clarifier design, centripetal pump liquid discharge, cooling jacket on bowl cover. 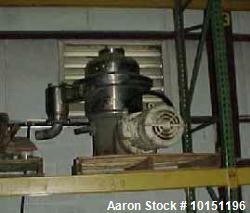 Belt driven by a 60 hp, 3/60/208-230/460 volt, 3560 rpm motor. 316 stainless pump, 304 stainless steel cover. 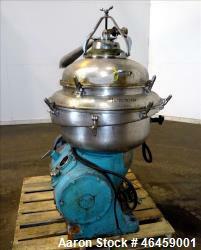 Used- DeLaval PX-207 Desludger Disc Centrifuge. 316 Stainless Steel Construction (product contact areas). clarifer design (liquid/solids separation), (note: can be operated in separator configuration with addition of non-drilled regulating ring), direct drive configuration 5hp, 208-230/460/3/60 motor, duplex pump driven by frame assembly. 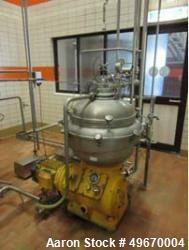 Used GEA Westfalia, Model SSD35-06-007 Centrifuge Clarifier, Stainless steel, 8,200 RPM maximum centrifuge bowl speed. With centrifuge bowl lifting crane. Ideal for separation of micro-algae, beer and beverage clarification, etc. Machine came out of Micro Algae clarification. Heavy liquids: 1.0Kgs/dm3. Machine complete with spare parts, tools, control panels. Operating and maintenance manuals. Single Speed. Wt. 3,700 lbs. Yr. 2011. 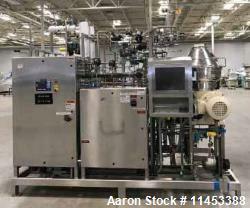 Used- Sanborn Recovery System Consisting Of: Mitsubishi model SJ-700 desludging disc centrifuge, aluminum construction, evaporator design, driven by a 1.5 kw, 3/60/208-230/460 volt, 1725 rpm motor. 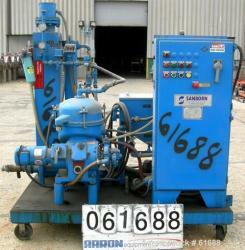 Includes Rosedale filter, cyclone, control panel and miscellaneous piping. Skid temperature range 60-165 deg F. Mounted on a 4' x 6' carbon steel mobile cart. 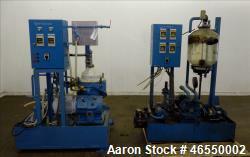 Used- Sanborn Coolant Recovery System, Model 2-1S500-3C. Consists of: (1) Mitsubishi Model SJ-700 Selfjector disc centrifuge, 2205 stainless steel/carbon steel bowl, aluminum top cover. Maximum bowl speed 9000 rpm, separator design. Driven by an approximate 1-1/2 hp motor. 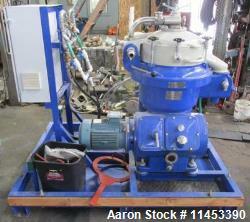 Includes a pump and heat exchanger. All mounted on an approximate 84" long x 48" wide x 37-1/2" deep sludge tank. USED: Westfalia CSA-19-06-47 Desludger Disc Centrifuge, biotech design. 316 stainless steel construction. Steam sterilizable with CIP feature, self-cleaning disc type bowl, separator design. 8150 rpm, rated solids 1.3 kg/decimeter, heavy liquid 1.0 kg/decimeter. Complete with drive, tools, full controls for automatic operation. 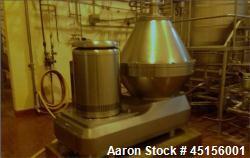 Previously used in biotech appliation and is in like new condition. Used- Westfalia CSA 160-47-406 Desludger Disc Centrifuge. 316 Stainless steel construction (product contact areas). Maximum bowl speed 6750 RPM. Clarifier design (liquid, solid separation). Centripetal pump, liquid design, 45 Kw 3/50/400 volt, 1475 rpm drive motor. 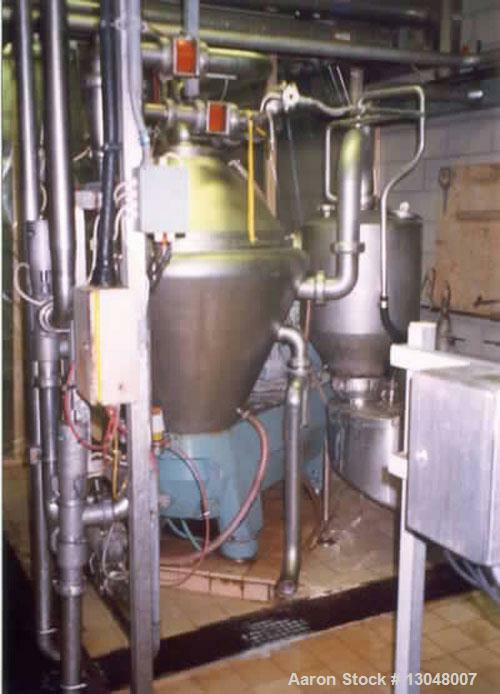 Complete with (1) stainless steel sludge tanks, (1) approximate 39 gallon (150 liter) stainless steel holding tank on legs and (1) control panel. Used- Westfalia SAMN15037 (SA-45-03-177) Desludger Disc Centrifuge. 316 stainless steel construction (product contact areas). Max bowl speed 4870 rpm. Separator design (liquid/liquid/solid separation). Centripetal pump liquid discharge. Belt drive configuration, approximate 45 hp drive motor. Last used in a Protein C3Application. Used- Westfalia SA-20-03-076 Desludger Disc Centrifuge. 316/329 Stainless steel construction on product contact areas, separator design (liquids/liquids/solids), heavy phase centripetal pump liquid discharge, light phase gravity overflow, direct drive configuration, approximate 11 kW(14.7HP) XP rated drive motor. Control panel with Allen-Bradley MicroView and Allen-Bradley Micro logix 1000 drive. Used- GEA Westfalia SC-6-06-076 Desludger Disc Centrifuge. 2205 & 316 Stainless steel construction (product contact areas), maximum bowl speed 12150 rpm, clarifier design (liquid/solids separation), centripetal pump liquid discharge, water harness, Allen-Bradley Drive, Allen-Bradley SLC 5/05 CPU PLC, Allen-Bradley PanelView 1000, 5.5 Kw Motor. 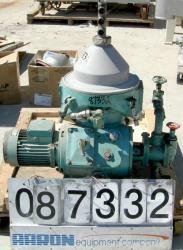 Includes a slurry tank, operating water tank, discharge tank, Yamada diaphragm pump, Netzsch progressing cavity pump, model NM015SY02S12B, driven by a 0.75kw motor, miscellaneous piping and valves. Skid mounted. 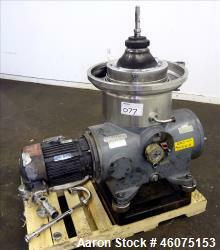 Used- Westfalia SB-14-06-076 Desludger Disc Centrifuge. (Unit set-up for XP operation), 316 Stainless Steel on product contact areas. Maximum bowl speed 7580 rpm, clarifier design (liquid/solid separation), timed solids discharge, centripetal pump liquid discharge, nitrogen purge port on drive frame, water harness, 10 hp explosion proof drive motor 230/460/3/60 (class I, group D). Used- Westfalia SA-100-03-177 Desludger Disc Centrifuge. 316 stainless steel construction (product contact areas). Max bowl speed 4870 rpm. Separator design (liquid/liquid/solid separation). Centripetal pump liquid discharge. Belt drive configuration, approximate 75 hp drive motor. Control panel. Mfg. 2007. Last used in a Fish Oil Application. Used- GEA-Westfalia OSC-5-02-066/5 Desludger Disc Centrifuge. Stainless steel bowl construction. Max bowl speed 7290 rpm. Separator design (liquid/liquid/solids separation). Light phase centripetal pump discharge. Heavy phase gravity discharge. Hinged top cover. Approximately 4 kw 440/2/60 drive motor. Includes: complete with pump, heater, control panel. New year 2002. Previous used on diesel and motor oil. 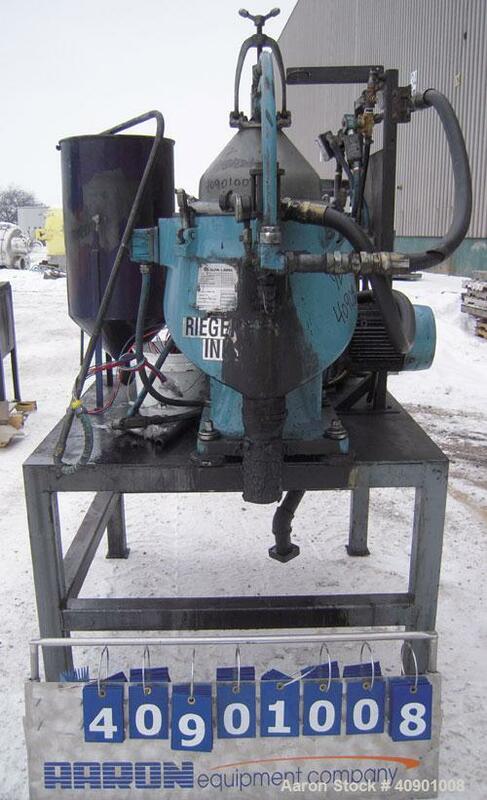 Used- Westfalia SC-35-01-177 Desludger Disc Centrifuge. 316 stainless steel (product contact areas). 6590 rpm maximum bowl speed, Separator design (liquid/liquid/solids separation), centripetal pump liquid discharge. Driven by a 18.5 kW, 3/50/380 volt, 2910 rpm belt drive motor. Includes control panels with A/B panelview 550 & A/B SLC 5/04 PLC, sludge tank and pump.